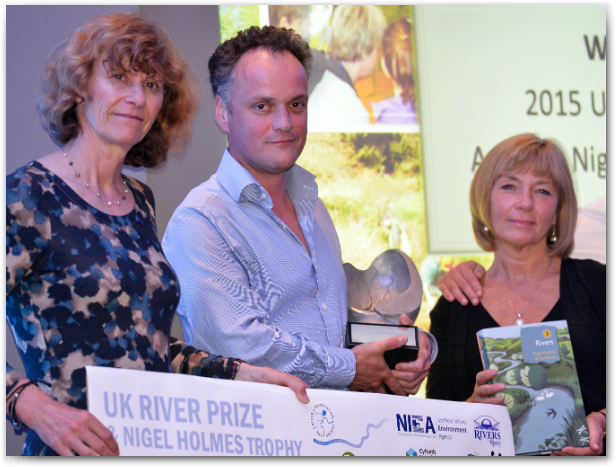 Earlier this year the River Tweed was announced as the 2015 UK River Prize winner. Luke Comins, Director of Tweed Forum, picked up a cheque for £10,000 and the Nigel Holmes Trophy during the RRC Annual Network Conference at Whittlebury Hall. Winning a prize such as this generates a lot of interest, as we saw with the River Wensum last year. It was therefore decided that we’d give our members a chance to see why the Tweed won this year’s prize by holding a site visit on the 24th of June. A good turnout met at Cringletie Manor, around 30 miles south of Edinburgh. Luke Comins, Tweed Forum Director (seen right picking up the Nigel Holmes Trophy at the River Prize Awards Dinner) gave an introduction to the project before we walked down into the valley to our first site. Standing half way up the valley, we had a great view of a newly meandered section which replaced what was essentially a straight drainage ditch. Chris Spray explained that most of Eddleston Water was like this following the construction of a new road through the valley in the 1700’s (now the A703). We then walked down to take a closer look at the channel, which looked great. 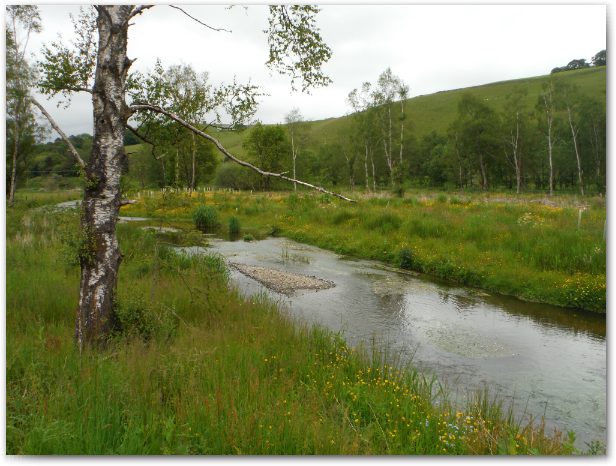 Gravel bars, riffles and patches of ranunculus are just some of the features that have been restored to Eddleston Water. This was an experimental reach which was made achievable through effective stakeholder engagement. Luke and Chris fielded question after question and lengthy discussions about monitoring, WFD targets and techniques. Unsurprisingly, we were a bit late for lunch. The conversations continued over some sandwiches and coffee before we made our way to the next site which was in complete contrast to what we had seen earlier. We were up in the headwaters of Eddleston Water where a small channel trickles through heavily ploughed fields. Prior to any interventions, the channel had high amounts of fine sediment and provided little habitat variability and shelter. This was seen as a fantastic opportunity to make cost effective improvements to Eddleston Water’s poor WFD status. Luke and Chris explained that improvements in the headwaters are considerably cheaper and can positively impact upon a longer stretch of the river than those further downstream. The channel has been fenced off and large wood has been used to introduce flow variability, improve water quality and help alleviate problems with fine sediment. There will also be a flood management benefit as the large wood will back up and slow the higher flows. 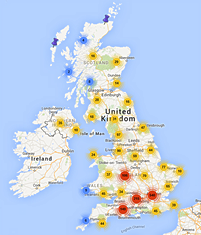 We’re just starting the process of organising the 2016 UK River Prize. You never know, if you put in an application we may be visiting your project next year!